We’re here in sunny, warm Miami training with Team USA. The squad has made lots of progress in boatspeed, handling, and racing skills over the last month, and we still have nearly two months left in our group schedule before the Miami World Cup starts at the end of January. It has been a real privilege to collaborate closely with our teammates and competitors, and it has given us a real sense of accomplishment to be riding this steep learning curve with them. Here is a video clip of some of our tacking practice from this week! Uploaded by Sarah Newberry on 2018-12-06. 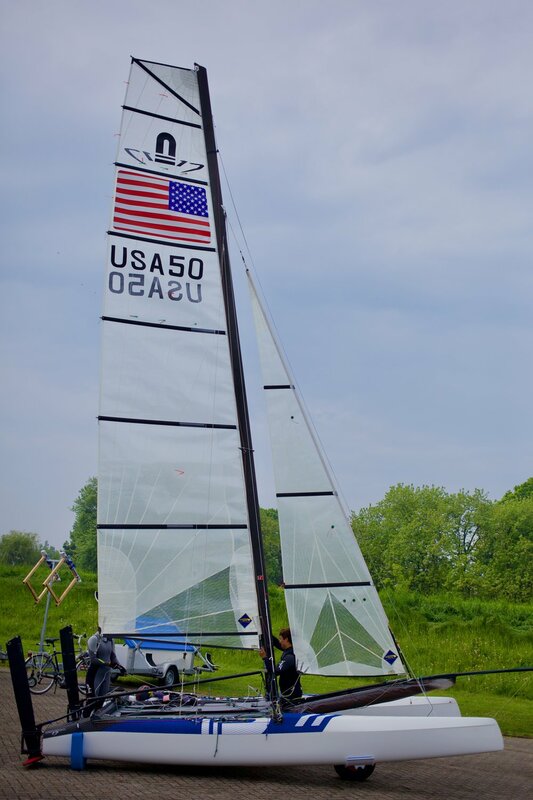 USA 50 Racing at the Oakcliff Triple Crown event. 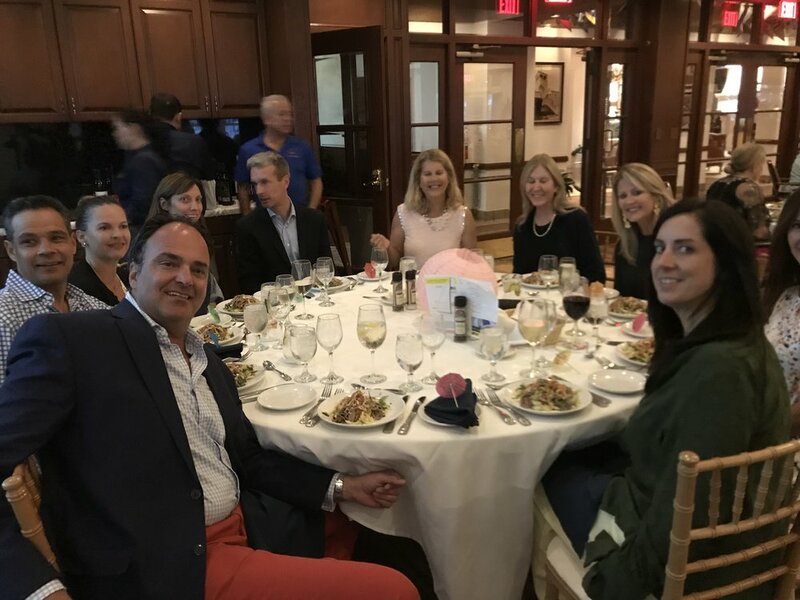 Last week we headed up to Oyster Bay, New York with our training partners, Parent/Atwood Racing, to compete in the first of three Oakcliff Triple Crown events. These three series events are an opportunity for Olympic teams to win funding to use toward campaign expenses. We had a great weekend of tight racing with our training partners! Our boat is currently in a container that is inching closer and closer to the Port of Miami. We can't wait to reunite with Belle Starr, but in the meantime, we needed some equipment to use for the first Triple Crown! 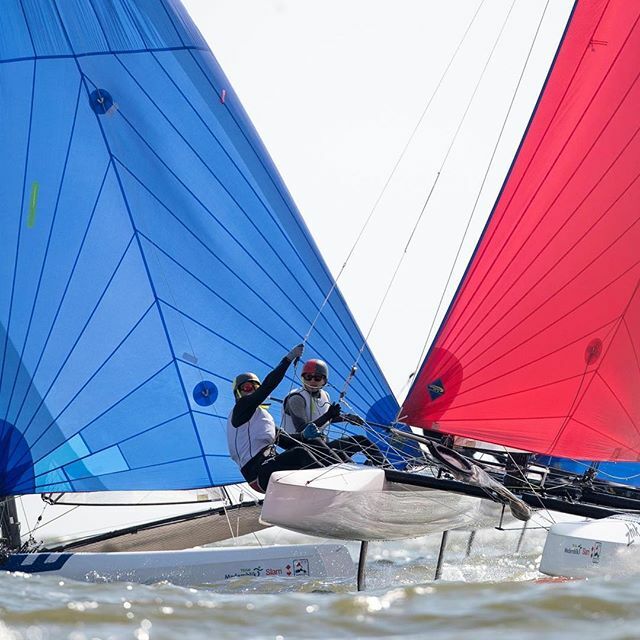 Luckily Oakcliff has a fleet of "retrofitted" Nacra 17s. These boats are a great resource and we're very lucky that Oakcliff has supported us by allowing us to sail one when our boat has been inaccessible this year. The fleet is between 3 and 5 years old, and the boats are used on a regular basis in the summer to teach young sailors how to foil around. The boats were originally c-board Nacras acquired by the program for the 2016 quad. When the new foiling boat was announced in 2016, retrofit kits were acquired by the program. Oakcliff's team cut open the hulls and installed the new board trunk system to accommodate the z-foils, and reinforced the sterns to support the rudder foils. The Oakcliff Nacras are trusty workhorses that have made it possible for many athletes to train, learn, and compete. Thank you Oakcliff!! Because we had just returned from Worlds, we had only two days to set up an Oakcliff boat and make it competitive before the Triple Crown. That's a tough task to accomplish with a foiling Nacra... there are so many small details that need to be right in order to optimize flight. With the clock ticking we threw the boat up on sawhorses and surveyed the rudder elevator angles and range, board angles and range, and rudder/foil system setup. We ran into a few hiccups and worked long into the evening on our first day, and all day the second day. Finally we were able to get out on the water for a test sail the day before racing... and were as ready to go as we could be! The conditions all weekend were light to moderate. We saw above 5 knots about 70% of the time. That means, 30% of the time we couldn't foil! The racecourse was only about 25 minutes long and tucked up between two points of land. Shifty, lake sailing style conditions made for lots of turn-arounds in the fleet. 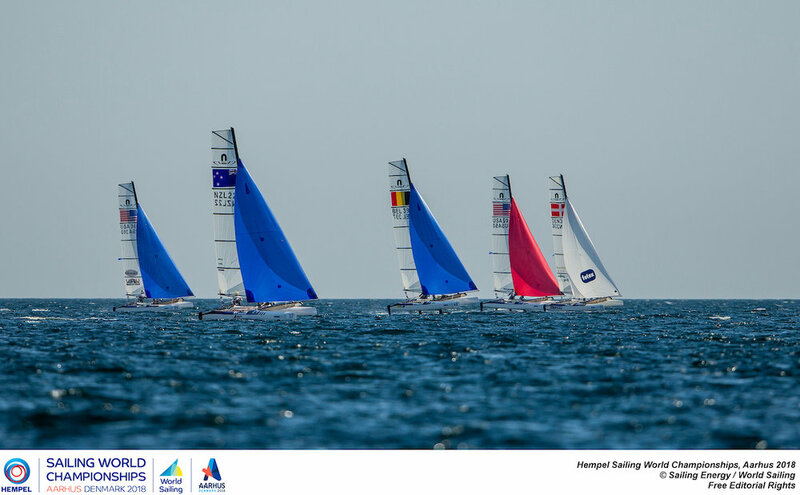 The length and the shifty conditions, as well as the light breeze, made this event a great experience for the younger sailors who had come in and hopped onto the Nacra to race for the weekend, and kept the racing close and tricky - which made us and our training partners stay on our toes! But when foiling conditions came up, the time that our two teams put in this year really showed, and we were clearly faster than the less experienced teams. Racing our training partners was challenging, just like it's supposed to be! After tying for the lead several time in two days, we went into the final race with three points between us. At mark two of that race we led by 20 boat lengths, but there were no other teams close by. We waited until the second beat to begin match racing. 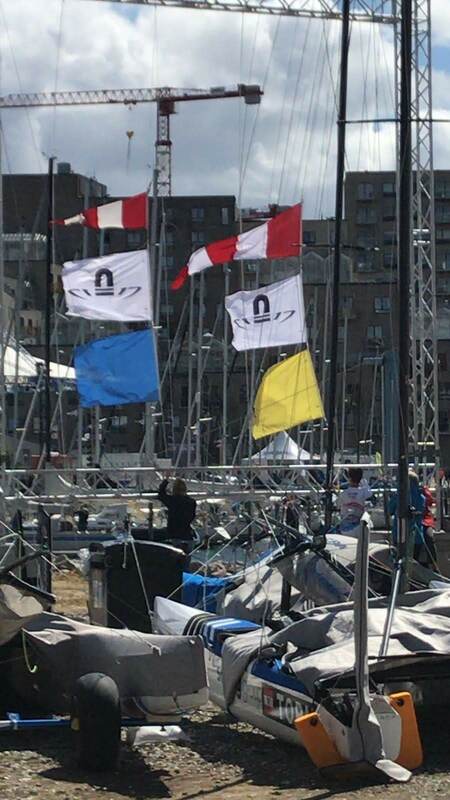 We managed to hold our competitors on the starboard layline and compress the race enough for the trailing boats to catch up, but as we both rounded the windward mark with protest flags flying, we had the umpire's call go against us... bummer! We spun and our competition was free to foil down to the finish line. Not the way we hoped it would end, but an excellent opportunity to match with our training partners and learn some new things. Second place at Oakcliff's first Triple Crown event is a great start to the fall season. Triple Crown II & III are coming up... and we're going to work our hardest to take the top of the podium and earn ourselves some extra funding for this season. At the end of Triple Crown we packed up our charter boats with our training partners and all hopped on the ferry across Long Island Sound to start a two week training camp in Newport, Rhode Island. We have been lucky to have some killer days of training here in Newport since we arrived. We even got to spend an afternoon foiling around on a TF10! Excited for the next week of sailing. Worlds was a great way to end our summer tour of Europe. When the summer started we had put in 5 months of sailing together in Miami alone on a retrofitted boat. At the time our focus was on just learning how to foil well enough to join the fleet and safely get around the course. We knew that once we were able to race well, our learning curve would skyrocket. Postponement and delay on day two of Qualifying for lack of breeze and the final day of Finals racing on account of too much breeze. Patience is, as always, a real asset in sailboat racing. Well, our suspicions turned out to be correct. Once in Europe and sailing with the fleet, we were blown away by how much we were quickly picking up. Truthfully, we were just as surprised by the number of challenges there were to overcome in order to get on pace with the fleet. Slowly but surely we counted our improvements over the summer even when setbacks challenged us to maintain our confidence. We pressed more energy into the campaign every day. The two weeks leading up to the Worlds we sailed our first full training camp with a tuning focus as part of the US Squad. It was the first time since we started training in January that we had a focused time block with other US teams and a coach. 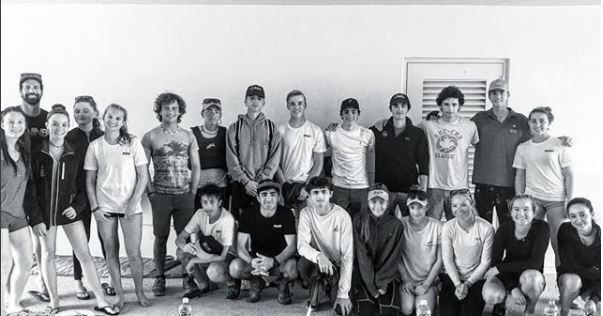 Along with Gibbs/Chaffee, Gulari/Scutt, and Parent/Atwood Nacra teams we emerged from a solid training block prepared to do battle at the World Championship. On day one of the Worlds we arrived at the boatpark feeling ready to send it. The forecast called for breeze into the high teens and low twenties. We made sure our spares kit was well organized and that we had lots of food and water in the coach boat. After a very windy downwind sail to the course we lined up with the other American teams to check speed and course features. When the starting sequence began we knew our priorities: balance, bow down, stay relaxed, look for lefties. Sarah’s Instagram story from the first day of Worlds! In the last 15 seconds to the start we were positioned to win the pin. First race jitters went out the window as we pulled the trigger. 10 seconds after the gun I looked back and realized that we had won the start. 30 seconds into the first beat we were leading the race. What a big change from a team that struggled to have Gold Fleet boatspeed at the Europeans only 3 weeks prior! 4 windy laps later we finished second to the Italian team of Tita/Banti. For the next two races of the day we used good starts and boat speed to fight for some top ten scores, and we ended day one of the World Championship in 10th place overall. We knew that this was not necessarily where we would be able to compete in moderate conditions, but we let ourselves appreciate how cool it was to have a strong start to our first Worlds together. Big takeaway from day one: we learned that we are pretty fast in 18-25 knots and big chop! For the next two days of qualifying we strategized to have good starts and sail smart races that would lead us to Gold Fleet. In lighter conditions of 5-10 knots, we didn't quite have the same edge that we did in the breeze. Our starts were good and we often sailed well in the first two laps, but struggled to put together a strong second beat. When qualifying ended we had a lot of notes for the future, and were happy with our qualifying position of 18th place. On to Gold Fleet, where the top sailors are all put onto the same racecouse - and the stakes get higher! Gold fleet racing is tough at a peak World Championship like this one! In the first day of the final series we struggled to start well, but fought hard for some top 15 scores. Our focus at that time was to fully utilize the opportunity to sail in what will be one of the most competitive fleets we will see for the next 7+ months until the next World Cup in 2019. Together with our coach we chose a few things to work on, and were happy with our progress. After 8 months of sailing together, we nailed some of our first full downwind legs completely stable on the foils (no ventilation! ), while looking around and focusing on strategy and tactics. That might sound like what you're supposed to do in a sailboat race, but I promise, being "head out of the boat" is way harder than it sounds in a foiling class in tight Gold fleet racing! On our final day of Gold fleet racing, the weather forecast was for a pretty wild and unstable offshore breeze with gusts into the high twenties. 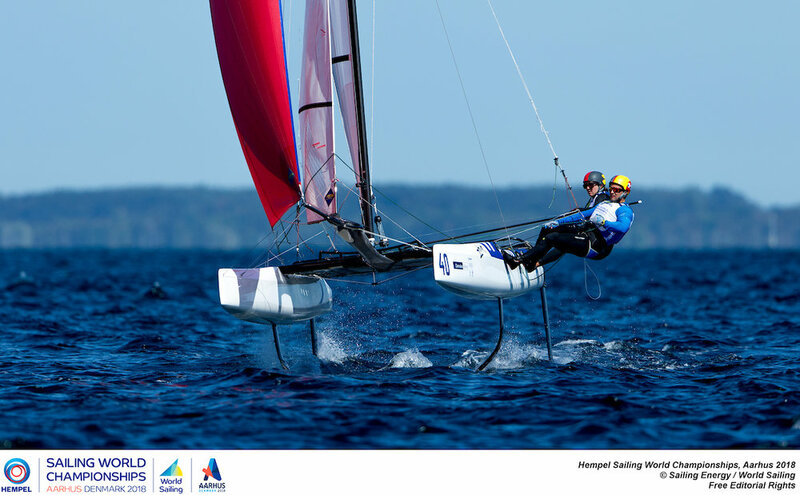 At first the Nacra Gold fleet was slated to sail on one of the standard inshore courses, but as the weather grew more questionable, the OA determined that it would be best to showcase our crazy foiling antics on the medal race course close to shore. With 15-30 degree windshifts and variations in the breeze between 12 and 25+ knots, I can promise you that it was an exciting day! We launched ready to give the last day of Worlds everything that we had. In the first race we worked our way up into the top 10 on the last downwind, but when we jibed in a massive gust to get to the finish line, we capsized. We did our best to keep some boats behind us at that finish and shake it off. Unfortunately the next two races we struggled to find a break. When the day was behind us, it was not what we had expected as a team. Our final day at the 2018 Worlds was a tough one on the water, but a great opportunity to see that flat water, shifty, gusty racing is a place that we can make a lot of improvements in the next year! So, we finished our FIRST World Championship together as a team as the 24th overall team in the world and the second US Team in the World by only two places. Are we satisfied? No, not at all. Am I proud of us? Yes, more than I can explain. We left many points on the table, but they have shown us a continued path to improvement and success. We have come far enough in only 3 months of active racing to snag top 10 finishes at the most competitive event of the last two years. Now that is something to be happy about. We are encouraged and motivated to continue on this steep learning curve that we started only a few months ago. At the end of our European season we head home for domestic training having demonstrated to ourselves that our potential is as great as we believed it would be when we decided to start this journey together in January. Training for the 2019 Worlds starts now. Belle Starr is on her way back to the United States! Only 6 days to go until racing! 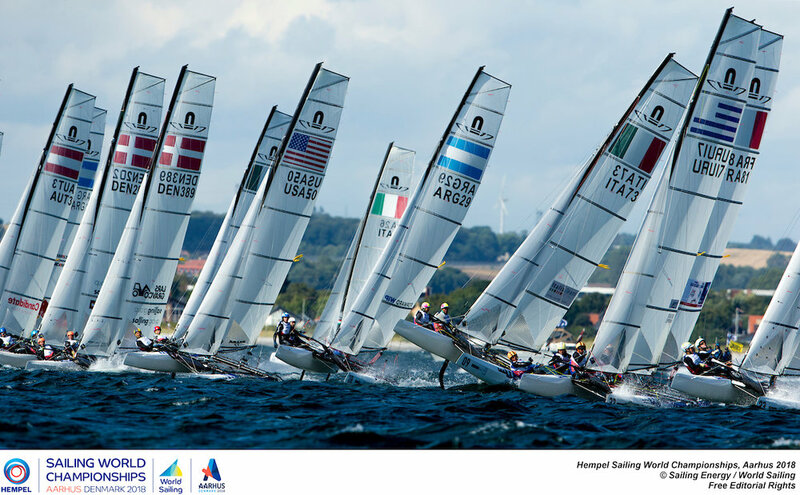 We have been here in Aarhus for a week now training with the US Sailing Team. There are four American boats competing here in Aarhus at the Hempel Sailing World Championships, and we have been working hard together to produce a top performance when racing starts in one week. The 2018 World Championships are a particularly special one. This event is the first country qualifier for the Olympic Games in Tokyo in 2020. The top eight countries to finish at this event will be awarded a berth to compete at the Games. As you can imagine, this is a peak event for the top teams from every country that is here to compete. We are so pleased to be part of the US Team effort to secure a berth. Over the last week the team has settled in, put in many on the water training days focused on boatspeed and technique, and spent some time in coaches' racing with the rest of the world. We are fast, happy, and prepared for another good week of training followed by a killer week of racing! This year's European Championship was in Gdynia Poland on the south end of the Baltic Sea. Conditions were often light with small chop. We have never been to Poland before, and can decisively say that the people were nice, the weather was beautiful and the food was delicious and inexpensive! As a new team putting in a lot of racing hours, we aren’t as focused on results goals as we are on process goals that will give us the tools we need to excel at the right times in coming two years. We used this event as an opportunity to troubleshoot some equipment and technique questions we had. We are pleased with the progress we made in challenging conditions and really stoked to bring it to the table in Aarhus this week for the Hempel Sailing World Championships. A huge asset in attacking these process goals in Gdynia was our involvement with the US Sailing Team. This was our second regatta sailing with them. The support we received on and off the water from our team mates and coach helped us improve in all aspects of our game… and we are REALLY excited for what is yet to come from Team USA! When to foil, when not to foil? Euros posed some opportunities to work on this question, and understand the strategy of it! 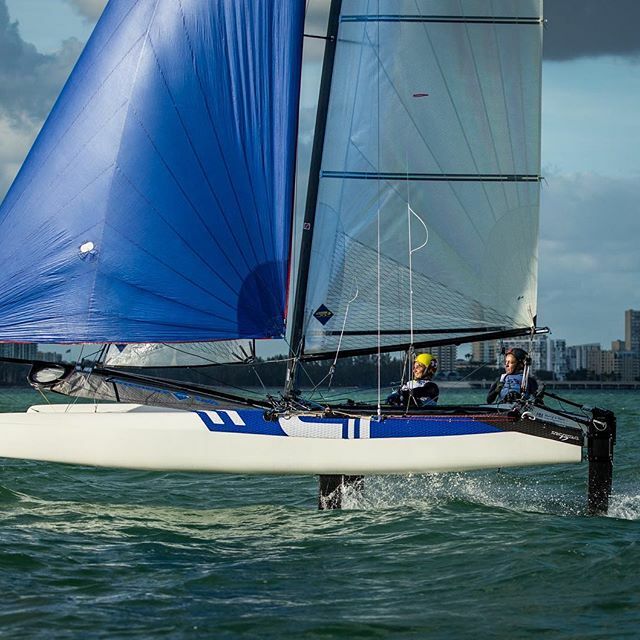 Sea state has more affect on the Nacra than the wind strength when it comes to performance. When foiling, waves are speed bumps! The wrong sea state and 12 knots can be much more difficult to sail in than 18 knots and flat water. At Euros we were lucky enough to see a variety of sea states.. great for the learning process! For the first few days a light breeze came from a direction sheltered by land, and we sailed in flat water. This made upwind boat speed a huge priority, and downwind foiling a secondary one. The last few days of the event the breeze was the same but the sea state was a bit more complex: a sloppy short chop mixed with waves. Upwind speed was still the biggest priority. Why? 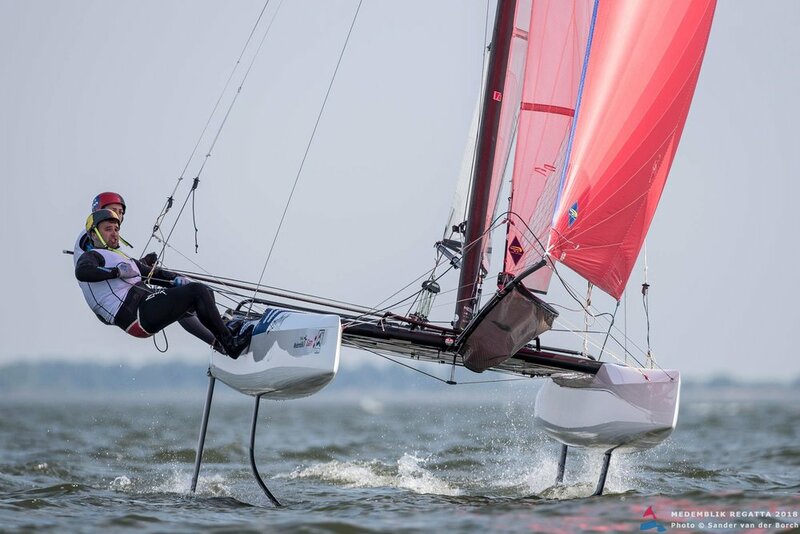 Because in light air foiling is actually not necessarily the main feature of a race. The first upwind leg is! It is too light to foil upwind, and the spread of the fleet at the top mark is unlikely to go through many drastic changes when the top speed of the boats is so low. That means if you sail well upwind and round in the top, you're likely to stay close to that position throughout the race! Our downwind foiling range starts at about 5+ knots... although it takes some work to pop up on the foils, if you can keep the apparent wind forward (by keeping the speed up) the boat stays on the foils. A few wrong steps or a luffing sail and the boat will drop off the foils. 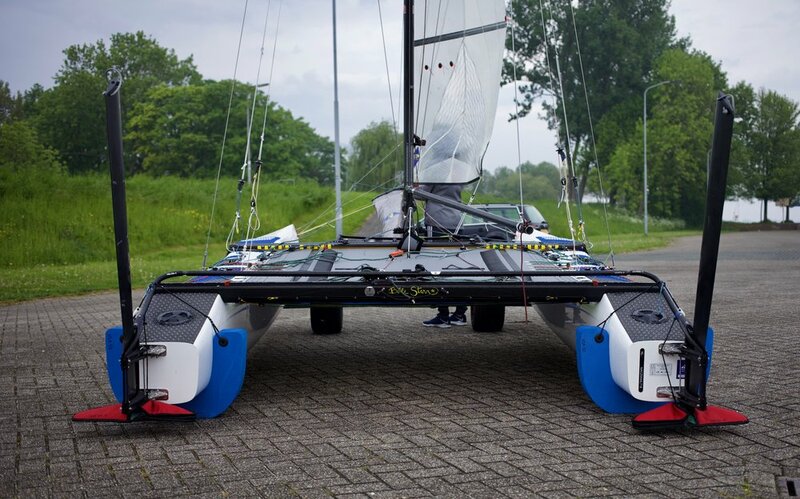 It is an investment of speed and distance to get the boat up and flying, so teams have to be clear and concise about whether the foiling mode is the best mode at the low end of the breeze range. The average breeze range we saw at Europeans was 4-12... perfect conditions to make choosing the mode hard sometimes. We had great speed downwind in Poland, and feel really confident about our ability to keep the boat foiling in light conditions. Unfortunately, these assets were not as important as upwind boatspeed is in light to moderate wind conditions. After the first day of racing, it was clear that we had an upwind speed problem and it made it extremely hard to compete in light choppy conditions. The regatta quickly changed from a chance to perform to a great opportunity to line up against the fastest boats and improve our boat speed. And that is what we did, every day we got a little faster and could hold our lane a little better. On top of that, our downwind speed had us passing boats every downwind! We finished the regatta happy with our progress in boat speed. We had the chance to work closely with the US Team coach throughout the event, and are very confident in the changes we've made and the learning opportunities afforded to us by such a tricky boat speed handicap. Now, two weeks of solid training with the US squad in Aarhus, Denmark followed by the 2018 World Championship is what we are focused on! Medemblik Regatta was the first European regatta of our campaign, and our second regatta since we started sailing together in January. Our goal was to check in with the fleet and see if the work we have been doing on technique and boat handling while we were alone in Miami was where we wanted it to be. We're really excited to say that we met those goals and then some! 8th in the medal race and 10th overall is an awesome way to start the European season. We are thrilled to be back out racing with some of the top boats in the world. Lots to learn, can't wait to get back out on the water and keep pushing hard throughout the summer. Jibs up, here we go! Day 1 of the Medemblik Regatta. Feels great to be getting back out on the water with some of the top teams in the world. 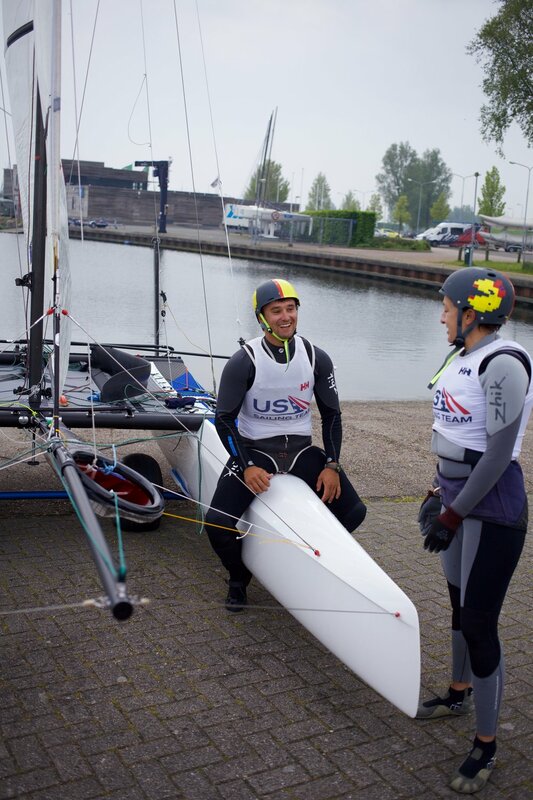 #jibsup #usa50racing #teamfun#icantbelievethesunisout — at Regatta Center Medemblik. The Christening of Belle Starr! 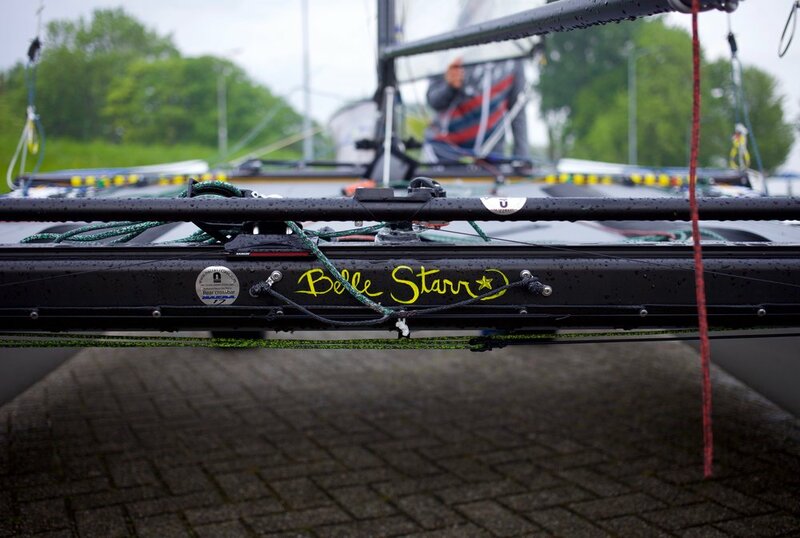 Today Belle Starr was officially christened and launched in Medemblik, Netherlands. For those of you who are not familiar... Belle Starr was a notorious American outlaw in the wild west, commonly known as "the bandit queen." Seems like a good name for a fast cat like our new Nacra 17. Since old Oklahoma's sandhills you did roam? We have met the newest addition to USA 50 Racing... and we can’t wait to take her for a flight! For now, more boat work! Thank You to Our Miami Donors! @emmettmoore @lizzynewberry@andrea_living @exercisingcement@michaeltsmoore @lesliejlott@teamparadiseinc @bydesignjewelers@jessynite @worthit4style, and David Bianchi and James Flood. #teamfun #nacra17 #coralreefyachtclub#miami #usa #sailing #biscaynebay. 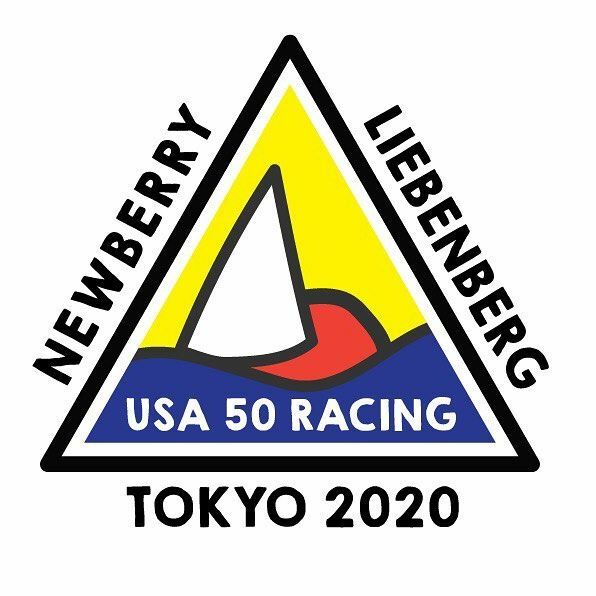 New USA 50 Racing Logo! 👋🏽 hello world 👋🏽 meet USA 50 Racing! Sarah designed our new logo, what do you think? 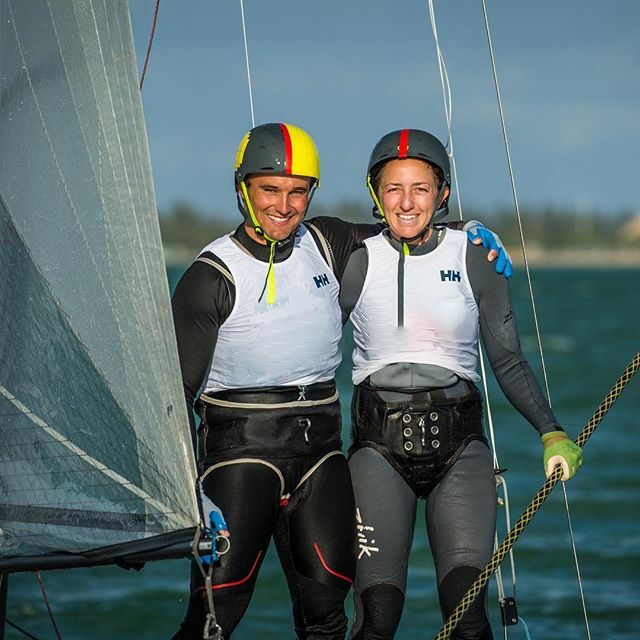 USA 50 Racing - Miami has delivered great conditions again! A Day in the Life of an Olympic Sailing Campaign! The beginning of an Olympic campaign requires a lot of dedication and legwork, and we thought we'd share a little insight into the process with you! In the next few paragraphs we've shared a few quick facts about starting a new Olympic campaign. We wonder if its the same in other sports, and would love to hear from other Olympic athletes who can relate. Your Resources: At the beginning of a campaign there are a lot of things you don't have the luxury of doing. Usually this is related to funds and performance. Limited funds = discretion and selectivity. Performance (takes lots of days of leg work) = outside support, confidence, determines equipment focal points, and creates mile markers of progress that you can use to develop more performance goals. Example: taking a brand new program abroad for a month with a full time coach is sometimes a wasted expense - it might not actually offer the kind of return in performance you expect for the cost. On the other hand, there will be opportunities in training/coaching not to be missed... because the return on investment (in performance) is high! The budget is sacred, and what we choose to do in the coming months makes a big impact on how we feel and perform as a team. We feel confident and excited about how our experience has guided the planning process so far, but there is more to do! No pressure right?? Monthly Breakdown: As of today we have been a team for just over two months! In January we sailed 19 days, did 10 days of boat work, and coached 2 days. In February we sailed 10 days, did 12 days of boat and fundraising work, and coached 6 days. This month there is much more sailing and work in store to get the show on the road in Europe in May. 10:15-11:30 - Review video and plan for the day, return emails, work on logistics, lunch. 12:30 - Time to go flying! 3:30/4 - Hit the dock, derig and dress. 4:30 - Boat work if any. Usually there is something to be done... it wouldn't be a sailboat if this wasn't true. We've been hitting the water and gym pretty hard here in Miami. Each day is a mission, and we are learning so much. Excited for the wake up call tomorrow - we have an early flight to catch... also known as a morning session on the Nacra 17! I had the coolest opportunity to talk to Sean Sechrist from Unbeaten Path a few months back, just before David and I started sailing together and subsequently decided to take our talent back on the campaign trail to Tokyo. Sean hosts "Unbeaten Path," a really great podcast on, as I take it, how to follow your dreams no matter how strange and different (or off the beaten path!) they may be! I hate listening to myself talk, but honestly when Sean sent me a link to the finished podcast I sat in my car and listened to the whole thing from beginning to end because the conversation is actually SO good! Check it out, take a listen, be sad, happy, inspired, or whatever you wanna be. Guys. I had this huge realization while doing this podcast... I have a seriously weird job. I don't often take the time to stop and think about the fact that the path I have chosen as a professional is totally unique. Your words and actions matter. If someone is pursuing an objective you don't understand, don't forget that a little encouragement goes a long way. If it doesn't seem possible to you, don't assume that someone else can't accomplish it... even if the task seems huge! When your goals are out of the ordinary, you take some falls, and usually have one or more supportive people around who make the journey a little easier along the way. Thanks mom, dad, and all of my family who not only physically helped me along the way, but also offered supportive words and positive feedback instead of criticism at very important moments. 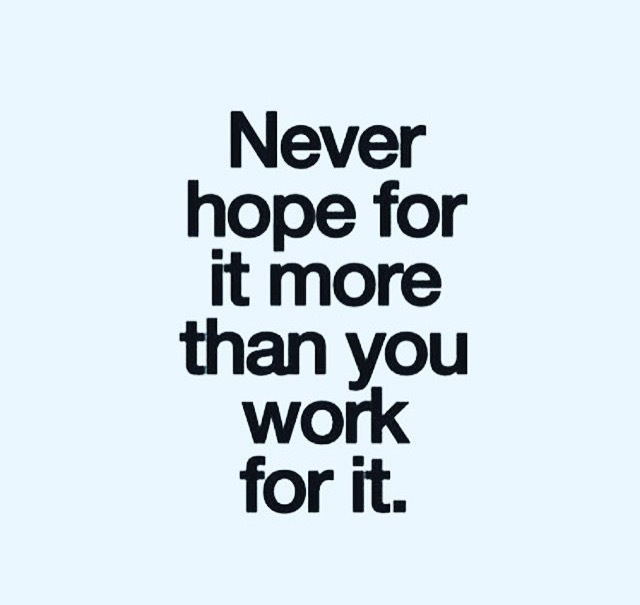 It's actually pretty hard to follow your passion and make a living doing it, and most people don't always know that they're on the path to their dreams until they wake up one day and realize that they're nearly there. I didn't go to the Olympics as anything more than a training partner last quad, but I have been a professional athlete and coach in the sport for years now. I wake up in the morning, go to the gym, then the boat park, hit the water and give 100%, de-rig, review video, work on the website/make a blog post/talk to supporters, eat dinner, crash, wake up and do it again. I have won titles, taught incredible athletes as a coach, traveled to many world championships as a sailor and coach, and built invaluable skills. I have been living my dream while trying to pursue bigger dreams! How fortunate I am. Get off the beaten path every once in a while if you haven't chosen to do it as a job. Sean's podcast is great inspo for this. Say yes to a change in your life. Try something new. Challenge yourself to take a risk. Work hard. Sweat. Go foiling! Happy Tuesday! Our first regatta is in the books! After only 11 days in the boat, we are thrilled with our performance place at Sailing World Cup Miami. On the third day of racing we were sitting in 11th place and ready to make the jump into the medal race on the final day. The weather gods had other plans though. The final day or racing was canceled due to high winds and waves. We ended up 11th, missing the medal race by only a couple points. This was a great opportunity for us to sail against the top boats in the world. From here we can set our priorities and structure our training over the next couple months before our first event in Europe this spring! Question: What has SF inspired you to do? Our vision was to bring athletes together to learn from each other. The 29er class has a culture of sharing and teamwork, so last weekend (Feb. 17-19) 25 athletes from North America shared their secret recipes. We had an amazing staff of coaches and presenters to guide the conversation on a variety of topics, from foiling to fitness, and inspect our sport at all angles. Thank you Chris Williford, Sarah Newberry, Fred Strammer, Luke Muller, and Jim Menzies." As part of our sponsorship of the US Sailing Team Sperry, several of the team’s inspiring athletes recently joined us for two iconic boat shows in Newport, Rhode Island, and Annapolis, Maryland. The Newport International Boat Show is held each year in September on Rhode Island’s scenic coastline. The show represents a boat enthusiast’s nirvana with a full range of powerboats, sailboats, marine equipment and accessories, including Sunbrella fabrics and our Perspective New England Rhode Yacht. 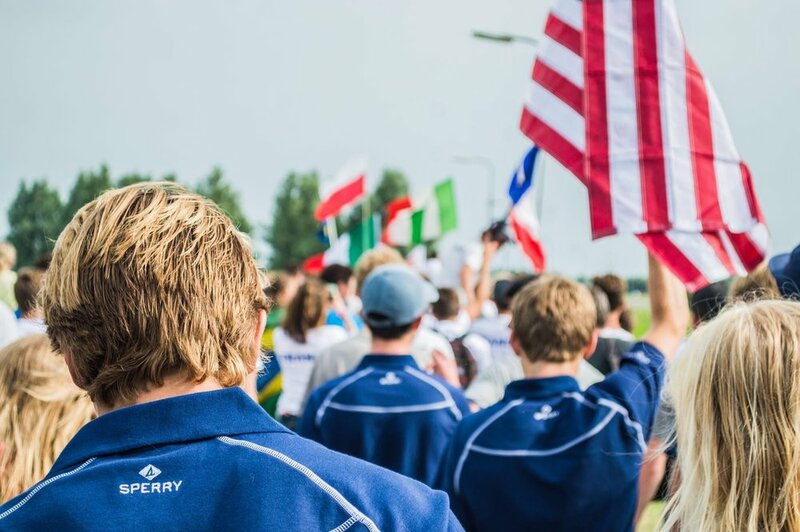 This year, show attendees had the unique opportunity to meet athletes on the US Sailing Team Sperry to learn about the joys and challenges of pursuing an Olympic dream. 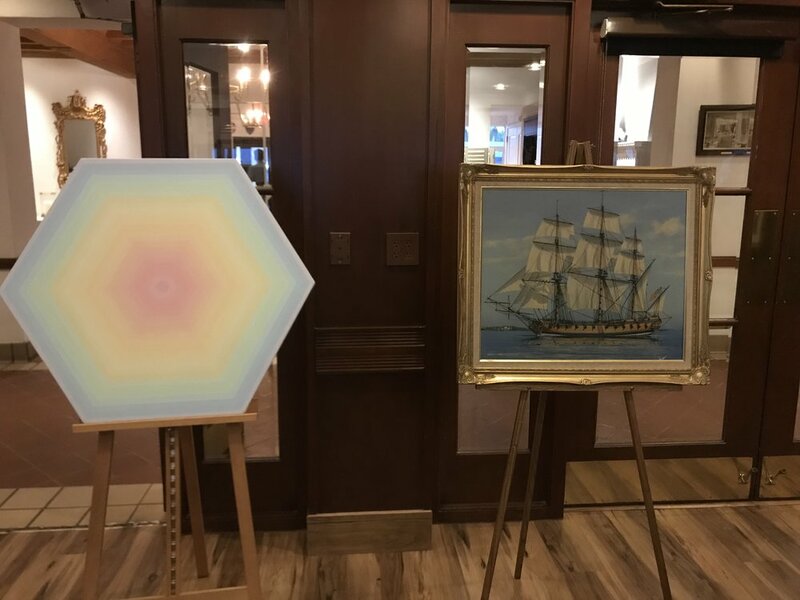 As the sun began to set on the first day of the show our party kicked off at nearby IYRS, a trade school with a mission to teach the skills, history, art and science of making, building, restoring and maintaining boats. US Sailing Team Sperry athletes Cindy Walker and Sarah Everhart-Skeels, and Annie Haeger and Briana Provancha were in attendance. An inspired, outdoor setting with a breathtakingly beautiful Newport sunset set the scene for IYRS alum Anthony Daniels to play the night away on his handmade guitar that he crafted from reclaimed wooden boat parts. Three weeks later, the Rhode Yacht traveled 400 miles south to the United States Sailboat Show in Annapolis. The sailboat show is the first of a two-week boating takeover of this historic, seafaring town and is the largest and oldest in-water sailboat show in the world. Boat show attendees gathered at the Maryland Inn for cocktails and conversation with US Sailing Team Sperry athletes Sarah Newberry and teammates Rick Doerr, Hugh Freund and Brad Kendell. Guests and athletes chatted into the night, swapping sailing stories and laughter. Everyone left with their very own US Sailing Team Sperry bag made of Sunbrella canvas, ideal for cheering on the team when they head to Rio. Miss us in Newport and Annapolis? Keep up with the latest from US Sailing Team Sperry and their push toward the 2016 Olympic and Paralympic Games in Rio by visiting uncharted.sunbrella.com and following them on Twitter @ussailing and Instagram @ussailingteam.